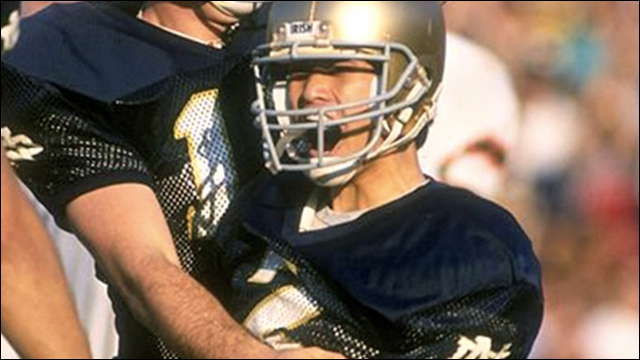 Ken Jeong's "30 for 30" short for ESPN tells the story of Notre Dame's legendary walk-on kicker. This is the incredible story of the most unlikely person to ever play college football. A guy who, if you just looked at him, had no business playing the game for Notre Dame. But he became a football folk hero. ESPN's latest "30 for 30" documentary short Student/Athlete, directed by Ken Jeong, tells the story of Reggie Ho, a pre-med student from Hawaii who walked on to Notre Dame's football team as a placekicker because he wanted to be "a more well-rounded person." At 5-foot-5 and 135 pounds, he was one of the smallest players in college football, but ended up playing a crucial role in the Fighting Irish's undefeated 1988 season. "I have nothing against Rudy. He's a fellow Notre Dame guy," says former Notre Dame quarterback Tony Rice. "But Reggie Ho deserves better than that. Reggie's a better story." I love it. Reggie kicks four field goals to singlefootedly defeat the University of Michigan. What does he do celebrate after the game? He heads to the library to hit the books. Reggie's gotta study. True student athlete. Is anyone working on the Hollywood movie version of the Reggie Ho story?